In Ep. 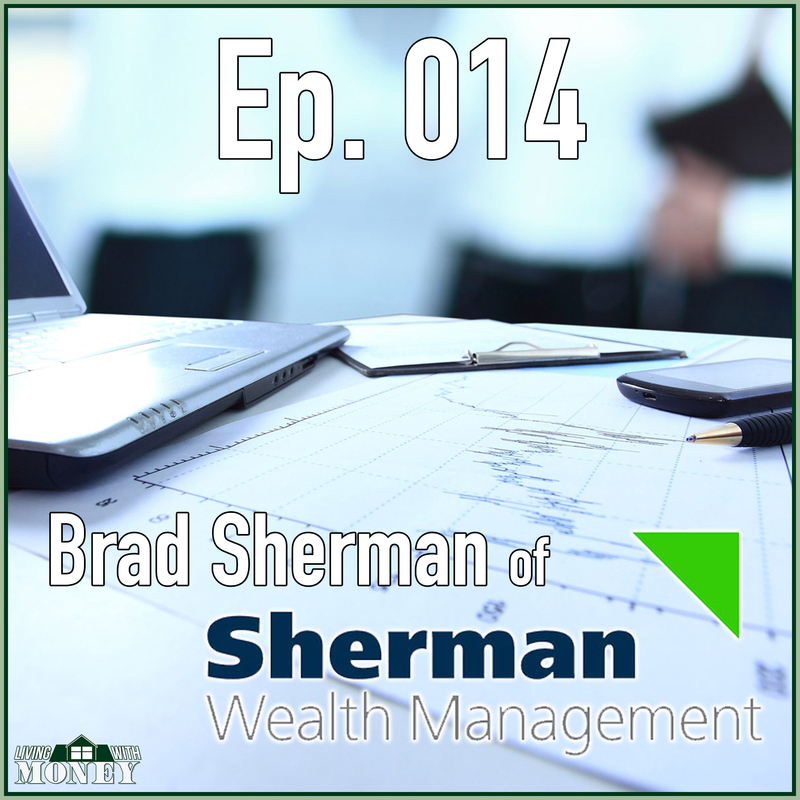 014, Tim talks with Brad Sherman of Sherman Wealth Management. They discuss the importance of understanding the difference between fee-only vs. fee-based advisors, managing a solo practice by utilizing technology to free up time, and the upsides of blogging and social media. They even get into a little baseball talk between Brad’s beloved Nationals, and Tim’s beloved Mets! Enjoy! Tim: Welcome back to Living with Money. This is Tim Mullooly. On today’s episode, I have Brad Sherman from Sherman Wealth Management here with me. Brad, thanks for coming on the podcast. Brad: Tim, happy to be here. Tim: Me and Brad have been Twitter friends for a couple of years now. We actually had the pleasure to meet in person down in Orlando a couple of months ago and decided that we would get an episode going. Brad, do you want to give the listeners a little background into your journey in life up until the point when you decided to open Sherman Wealth Management? Brad: Sure. Tim, it was great to meet you. With all this winter storm, I’d wish we were in Florida still, basking in that sun. Brad: Yeah. Believe it or not, I started the company right when my son was born. My wife was 36 weeks pregnant and I’d left a job that I was in. I just graduated from grad school, I was working full-time independent broker dealer, firm in Bethesda, Maryland. Left that opportunity and decided to kind of go out on my own and spent a couple of years learning about the different businesses. Starting from zero, starting an RIA was kind of out of the question given that my son was just born and all the expenses and things that come along with that. I started out through an independent broker dealer doing a fee-based planning and with no clients. Didn’t want to invest the money until I knew that I had sticky business model. After about a year and some change, I amassed enough to get on TD Ameritrade’s radar and transitioned over to them in August of 2015. Tim: Nice. Like you said, especially with your son being born right around the same time that you decided to start all of this, I think it’s probably a good idea to work with the broker dealer first. Then once you get some assets under your belt, transition into the RIA space. You know, from reading your blogs online, that’s what caught my eye. You talked about fee-only, and we’re also fee-only here at Mullooly Asset Management. Because I know you’re a solo adviser and the owner of Sherman Wealth Management, what’s it like being a solo adviser and kind of doing things on your own? Brad: Yeah. It’s hard. I have some support staff to help me with some of the admin work and we utilize a lot of technology which enables us to grow and scale. We use a robust CRM, we use DocuSign for all of our TD Ameritrade and client agreement docs, and so everything is paperless. Through the help of Orion, we’ve launched an app with them. We do all our scheduling online integrated through my calendar. Technology helps scale. We have about a hundred client relationships, and as you mentioned, it’s just basically me managing them at this point. Looking to bring on potentially a pair of planner and some other help as the year unfolds. Tim: Right. When we met down at TD Ameritrade, they were talking a lot about the different types of technology that you were just mentioning. You know, going paperless with DocuSign and all that, I bet makes it a lot easier to streamline processes instead of having to print everything out and put things in the mail and just makes it a lot easier. Is that what you’re finding? Brad: Yeah. It’s really easy to do. I mean, I feel like we have the back office of a billion-dollar RIA. You know, given that we’re right in the mid-30s and AUM and stuff. With the advent of technology and our client base, given that they’re mostly young professionals who want ease of use, DocuSign has been a lifesaver. Everything is on our client portal so that the clients can see it, so it’s totally paperless. You know, the old school way of filling out forms by hand and having a traditional admin to do that work is thrown out the window under what I’m trying to build. The best part of being a bit of an independent RIA is to have that flexibility to build your own vision of how you think it should work, which has been really refreshing. Frustrating at times on the tech side as we wait to have some of our tech vendors talk to each other, but as you mentioned, where we met at TD LINC, it’s a great place to be there with them, to hear the innovation of what they planned and what they’re working on, and then at times introducing those people to one another so that they could facilitate those integrations. Tim: Right. Yeah. It’s definitely good when you can have all of your technology working together to kind of streamline the backend stuff like you were talking about. With that technology, it probably frees up some time for you to focus on growing the business and also bringing in new clients and servicing the clients that you have. What kind of marketing activities, if any, are you doing to bring in new business over at Sherman Wealth? Brad: We have a blog we’re writing. As you know, how we met on Twitter. We’re doing local speaking engagements. I have a series at the office space called Beers with Brad. The April topic is going to be how to save for your children or grandchildren’s college. We wrote a blog about the changes to the kiddie tax and the 529 plan, so it’s going to be easy to discuss and talk about it with an audience. You know, traditional, just talking to folks. To be honest we’ve been mostly just really engaged with our current clients and solving financial planning issues and things with them. You know, that takes up a bulk of my time. That’s what’s great about technology, is that it enables me to be able to be on the phone with our clients more, know some of their hot button issues using some of the technology and reach out to them in an easy way. Tim: Right. Definitely, it’s easier than ever to stay in front of your clients, which is always a great thing. Like you’re talking about with the blog and social media, that’s just one more avenue that you have to be able to reach your clients. Brad: Yeah. We produce a monthly newsletter to clients in its initial sense of kind of summaries of our blogs and things that we want them to be thinking about. You know, changes like we launched the company Instagram and making those types of announcements, less market related stuff because they can see that whenever they want. More about like these tax changes and other things that could affect their financial plan. Interest rates rising, the Fed meets. We talk about their high-yield savings accounts that we’ve introduced them to for their cash that we don’t manage so that they’re maximizing everything to their full potential. Tim: Staying in front of your clients, like you said, on a monthly basis with the newsletter I think is a really good idea. Because a lot of times, you hear when clients switch advisers, it’s because they never hear from them anymore, or they don’t hear from their current advisers so they want to go look for someone else. I think in terms of client retention, stuff like newsletters is definitely a really great idea. Brad: We connect with all of our clients on LinkedIn and introduce them to all the social sites so they don’t have a problem knowing where we are. We’ve actually hooked through our client portal, all of our blogs kind of flow into a stream on their client portal so they never miss a communication. Tim: That’s really great. That’s something that we were thinking about looking into at Mullooly Asset Management is the client portal. Can you speak to any sort of feedback that you’ve gotten from clients about using a portal and the benefits of that? Brad: Yeah. I mean, they love it. I mean, they have a centralized single sign-on location where we have a deep aggregation partner where they can add their home mortgage, check and saving accounts, their 401(k), any assets that we don’t manage and it’s right there like a personal financial statement. Some clients have invited their states and trust attorneys or CPAs so it makes that process so much easier for them. I think that’s really where our value is going to be, is to make things easy for everyone, and the easier the better. That’s where I think ultimately the value that we serve is easy use on the financial side as well as the financial literacy stuff, which is important to both of us as you know. Because most of my clients have advanced degrees, doctors, lawyers, but had never taken personal finance course in school, and I noticed that in grad school. You know, I had some of the smartest accounting firm employees, Fannie Mae, Freddie Mac, local to DC and they didn’t know the first thing about what a 401(k) was. Educating them on those concepts is what really brought me to the business. Tim: We talked about it a lot here as, like you were saying, financial literacy is definitely not where it should be for most adults. You know, things like the portal that you’re talking about and this technology. There’s technology to help advisers streamline their business and it’s also technology to help clients keep everything in one place and keep it simple. Then, like you were saying, I totally agree, the simpler the better when it comes to technology and helping everyone keep things where they’re supposed to be and keeping things in one place so nothing really gets lost. In a basic sense, when you’re onboarding a new client, what are the first steps generally that you like to take with someone just coming onboard with your company? Brad: Right. We have a pretty fun survey, kind of like a pre-meeting checklist. We do two things. One, we send them the link to the aggregation vendor, which feeds directly into the financial planning software so it makes it very easy for people to kind of see all of what they have. Most people don’t have, as we mentioned before, one centralized source of all of their finances. A lot of the people that we service are newlyweds, within three or five years of marriage, or young professionals that may have four or five old 401(k)s elsewhere. Our first step would be kind of aggregating all of that together so they could see their full financial picture. You know we also use some risk tolerance analytics to make sure that if they do have money invested that they’re comfortable overlaying some risk tolerance on their portfolios, kind of analyzing what they have assuming that they do have assets previously, we’ll point out. Friends of ours have said on Twitter, kind of like the alphabet soup of like the mutual funds and kind of a bunch of different holdings and see if that’s tax efficient to unwind or point out some of the pros, cons, and otherwise of what they might have as it relates to legacy positions, keep in mind tax efficiency and such. Going back to the profile, we profile our clients. Kind of understand how they want to hear from us. Some people, believe it or not, in this day and age don’t want to get the blog or just want to hear from us quarterly. Which is rare, but we still want to respect their wishes. We survey everyone, kind of get their baseline. If they’re on social media, we tell them about where they can find us. Most people are at least on Facebook or LinkedIn, sharing news and informative topics then and there and so we just kind of keep in touch. A lot of the heavy lifting is done in the beginning as you know. Depending on the clients’ needs, if they’re in the market to buy a home, we might introduce them to a realtor or a mortgage professional. Or if they need insurance or a will, we’ll introduce them around. What’s great about being a fee-only introduce your adviser is that they know that the recommendations are ones that are conflict free and they feel more comfortable about taking a recommendation and being able to shop around and I’m on the phone with them helping to explore those relationships. Tim: Right. I know, like you said, the fiduciary response obligation that we have is a definitely a big thing for trust levels with clients and just making people comfortable knowing that, like you said, the recommendations, whether it’s for financial planning or for finding an accountant or an attorney, you know that it’s conflict free and they can trust you. Trust is such a big part of any relationship, especially when it comes to dealing with other people’s money. Tim: Getting back to one of the first things you said about technology and you have people just input their accounts and data into the aggregation, the benefit of that is they can’t really fudge the numbers. We found some people whether they’re … Most of the time it’s unintentional, but you ask people how much they spend a month of this or that and how much expense they have each month and some people just don’t know. That technology really just takes the guessing game out of it and really just puts it in black and white. This is what you spend, this is what you have coming in. Probably, for you, it makes the financial process a lot easier. Brad: Totally. Yeah. You know, the famous saying, you can’t prescribe without diagnosing. A lot of our value ad, as I mentioned, is that most people don’t even take the time to get to know their client on that deep of a level. Technology helps a guy like me scale to be bigger and act bigger, which is great, and the client feels good to know where everything is and it helps with goals-based planning and just kind of understanding. If they don’t have specific goals, which is also fine, kind of help them think about based on seeing everything in one centralized place. Tim: Right. It helps them understand where some of the recommendations might be coming from, because they can see what you’re working with and what date are you pulling from to make these recommendations. Tim: Like I said before, for listeners out there, Sherman Wealth has a great blog. We’re going to link to their website so you can check out all of his blog posts. We’re going to touch on a couple that just caught my eye. Recently, you wrote about the importance of having savings goals, but not just any goals in mind. You want to have them be SMART goals, the acronym, S-M-A-R-T, SMART goals. In terms of saving money, can you kind of elaborate how that acronym applies to savings goals? Brad: Sure. In a very Seinfeld-esque way, the company was formed on people that I know that I came across in my life. My mother who was a single mother school teacher, my father who was a young associate at a law firm, or very close friends of mine who were in different fields, and even myself who my wife had a large amount of student loan debt when we got married or wanted to buy a house for two, did for our two kids last year. SMART goals helped me and helped the original client base, I guess, for lack of a better term, the friends and family achieve kind of what they wanted to do. My wife and I paid off her student loan debt, which is a great feeling, and then we bought that house. We were saving for the home and what we do is kind of used bucket strategy into like a high-yield savings for short-term stuff and break up the chunks of, you know, I talked about a vacation or anything else that might be important for your yearly planning. We kind of break it up into 1/12 of the amount of what we think it would be so that when the bill comes for car insurance or life insurance or anything, it’s not a freak out and that you have that money saved and accounted for and it’s part of the monthly cash flow, which I found that clients and myself, it really helps ease these bigger ticket items that pop up. Tim: Yeah. It definitely makes it easier to swallow when you break it down on a monthly basis like that as opposed to just one big number that you have to reach. It’s more realistic and manageable. Brad: I agree. By segmenting it, you’re able to do baby steps and being 1% better every day. As we know from being in finance, compound interests, just setting these habits and making them habitual or key to financial success and ultimate freedom depending on what it is that you’re trying to solve for. Tim: Definitely agree with that. You also wrote about some changes that are coming in 2018 to the tax code. Specifically, you mentioned that there are a couple changes coming to the kiddie tax and 529 plans. On a kind of broad level, do you want to touch on a couple of the changes that you see are pretty important for people to notice about the kiddie tax and the 529 plans? Brad: Yeah. Sure. As I mentioned, I mean, I’m 38, a lot of our clients are into 30 and a 40 range who are young family starting out who were saving for their children’s college. Believe it or not, we have parents of those clients that may be saving for their grandchildren’s college. The ability to pay for private school and things that are not just college and above is an interesting thing to some of our clients. We’ve actually worked on the blog with a local CPA who … As you know, we can’t give tax advice directly so I felt a little bit better. Got him to help before. He was kind of in the trenches in March with super tax time. Yeah. There are changes to the deductibility. Then as it relates to the kiddie tax, some of our high-net-worth, the young families that may have done an UTMA account instead of a 529, we just wanted to point out that it’s going to be taxed a little bit differently. That maybe they should revisit if that’s the most beneficial to their unique situation. That’s the great thing about the blog and just being able to do this stuff and posting it easily online and sending it out to clients and stuff, because just the speed of communication. You want to make sure that they’re seeing it from you before they get super confused. You want to be their first point of contact for the things that they might not understand. Tim: Yeah. With the blog, it’s kind of a preemptive thing. You know, you can deter some phone calls into the office if there’s a confusing topic to some people like taxes or changes to the tax code. You can put out a blog post about it and cover it before they even have the chance to call in. You can just put that out and get it right in front of them in a way that they can understand and make it nice and simple for them. Again, that’s just another benefit of having the blogs and social media. Brad: I couldn’t agree more. Yeah. Tim: On your blog, I’ve noticed a handful of times you talked about the importance of knowing the difference between fee-only versus fee-based. Tim: A lot of people out there are unaware that there’s even a difference because they’re so closely labeled. Could you talk a little bit about understanding the difference between fee-only versus fee-based? Brad: It was really eye opening to me, you know, especially this commission world. As I mentioned, my mother came from … She was a public school teacher and we’ve written about how egregious the commissions and things are on the 403(b) plans for teachers, and this got me kind of most interested in the fee-only world and discussion. Fee-only only just means … I think it’s a simple form to explain what fee-only means, and then there’s nothing really to be said about the others is that every dollar that Sherman Wealth makes comes from the clients directly. There’s no soft dollar relationships with a mutual fund company or MUTF provider or any of the professionals that we may link up to. Other firms that are fee-based, if they sell you a mortgage or a life insurance policy, they’re getting paid on this as well. They may have sales goals or quotas, different products. We’re very transparent in the fact all of our clients know what fees they’re paying, they get an invoice, and it’s out in the open. Versus I think in the fee-based world, it’s a little bit more confusing to the end consumer. As we’ve talked through this podcast about financial literacy and even people with advanced degrees, it’s very complicated. Our world, I read somewhere that we’re like the third most untrusted profession near behind car salesmen and something else. Just trying to bring some transparency and sitting on the same side of the table with our clients. Tim: I think that kind of topic can’t be talked about enough because, like you said, people don’t know the difference or that there even is a difference that someone that you’re working with might not have your best interest in mind. It almost seems counterintuitive to common sense or how you would think people would act. I think it’s definitely a topic that’s worth bringing up over and over again to make sure that people understand it. Tim: What’s one thing that you would want people to remember your firm, Sherman Wealth Management by? Brad: I think it’s cliché talking to a guy who we met on Twitter who gets it, but the financial literacy, knowing that they have a safe place to kind of ask any question. As we know from growing up that no question is stupid question, but I think that there’s a tremendous amount of financial anxiety and other behavioral biases that come up through money. We talked about money a lot growing up. That didn’t mean that we necessarily had a lot of it, but we knew … I did read the Wall Street Journal with my father when I was five or six and brought his stock broker in to take your kid to work day or whatever. Not every family operates as openly as that. I think that that was a big positive and it had a big effect on my life and what I’m able to help educate and teach clients about. Tim: I think that that’s a great thing to want people to know about, because a lot of people in our industry, it can be kind of intimidating to work with a professional, especially if you don’t know what you’re talking about. You know, I commend you for wanting to educate your clients and keep them as well educated as possible. That’s really great. Tim: We’re going to ask a couple questions not really geared towards Sherman Wealth Management. First off, how would you define being wealthy? Brad: Man, that’s the hardest thing to solve. Being a financial planner for myself and all, since we’re being raw and honest with each other, it’s the one I have trouble with the most. As I mentioned, we bought a house and I thought that I would feel a little bit better about the wealth term. Then the bar raises and what you thought would define that for you, you know, you want to keep pushing. All of these things that we educate clients on, Kahneman said, we all exhibit these biases ourselves. Look, I’ve got two great kids. They have eight grandparents that are all healthy and alive. My kids have three great grandparents, one who’s going to turn a hundred in a couple of months, which is really great. Brad: We’re all healthy. I’d say, as cliché as that may sound, that’s a factor of wealth as well. Being able to pay off my wife’s student loan debt after a lot of her hard work and ours. Launching the company with zero clients even though, I’m sure as your dad would say, it’s not to where he wants it to be and he tinkers with it every day, it’s still a great feeling to have to have built something. Tim: Absolutely. That’s really great. Outside of work, you’re talking, you know, you have your kids and your family, what’s one thing outside of work that you’re very passionate about? The only thing I have time for really is the Nats. We’re taping this in time where my thing that I’m passionate outside of work actually comes to fruition and spring training is almost over, which is great. Wisconsin football, I guess, during football season. Yeah. It’s just the Nats and Wisconsin football, I would say. This NTA tournament has got me … We were on vacation last week so it was the first I didn’t watch that Thursday, all day probably in my life. There were games last night and I’m looking forward to the games today. What about you? Tim: I love March Madness as well. One, I was going to get to baseball in a little bit. Or next question, actually. Because I know that you’re a big Nats fan, I’m a huge Mets fan. We’re all Mets fans here at Mullooly Asset. Let me ask you, how many games behind the Mets do you think the Nationals are going to finish this year? 2015 all over again? Brad: If that happens, I’d be very surprised. Brad: It’d be upside down world. It’s fun. Last year, I actually took my son to spring training. My father and stepmother live about 10 minutes from the new Nats stadium. The Nats moved in their spring training last year. My dad is actually going to the game tonight. He called me earlier. Yeah. I spent the least amount of time looking at the spring training stats and roster that I probably ever have, which is embarrassing. Maybe because my son is not as into it this season as he was last year, so we’ll have to get him more into it. All I’ll say, back to your 2015 retort is that we’re happy that Daniel Murphy is on our team now. Anything you want to say about all those years … Yeah. Tim: No. No way. I mean, last year was a mess for the Mets and it’s always the case with them. We’re going into this year thinking, you know, if they can stay healthy, they’ll be okay. With the Mets, that’s usually the biggest IF possible, because any baseball fan knows the Mets get hurt left and right every year. The Nats are definitely poised for probably another NL East title this year, assuming everything goes according to plan. Did you go to any of the post-season games last year with the Nats? Brad: I did, three years in a row since you brought up source subjects of 15. Maybe I’m the problem, but the last few years … I was at game five, I was at the Kershaw game when he came in on the ninth and shut us down. Then I was there last year. It was awful. I was with a client, we had a great time, but it was a long ride home. Yeah. I have been to both game fives. Before kids, I had a like a 10-game plan which is awesome to go to. When I was in grad school, they had like a student discount ticket, which is great, to take advantage of a student discount at 30. I felt like doing that or something. Yeah, it was fun. I hope to get to a couple games this year with our kids. My son loves the Racing President, so it’s about this time when he got into him about three years ago. We’ll see if we can get our daughter into it, too. It’s funny. My son is very competitive and we have a race. Anytime we race, he picks the Racing President and he makes me pick one. It’s a fun thing to do. We’ll watch the YouTube videos of the Presidents’ races from the games we don’t go to. It’s a fun thing to do with your four-year-old son, for sure. Tim: Yeah. That’s great. You said you went to those, the last two games, the post-season games. Maybe if they make the playoffs this year, third time is the charm, maybe you’ll actually turn into the good luck charm for them. Brad: Maybe. Hopefully. From your lips to God’s ears, as they say. Yeah. I thought you could take it another way and maybe I should just save my money and, as an astute financial plan, I should not waste money on a heartbreaking loss. Tim: That probably would have been better advice, yeah. Tim: Oh, well. I hate to say it, but best of luck to the Nats this year. Tim: If you’re listening to this on iTunes, please subscribe to the podcast to get new episodes every week. Feel free to leave us a review or a comment, because it would really mean a lot to us. Be sure to follow us on Twitter and Instagram at @LWM_Podcast for more news and updates about the show. Tim: That actually does it for all the questions that I had so we’re going to wrap up this episode. Brad, thanks for coming on the podcast. It was nice talking to you. Brad: Awesome. Thanks for the opportunity again. Tim: Anyone listening out there, I’m going to link to Sherman Wealth’s blog and their website. Be sure to check them out and read all the awesome blog posts that they put up. Thanks for listening to this episode of Living with Money and we’ll see you on the next one.